A treadmill can be a necessary evil to many runners. For winter speed work and tempo runs I have accepted the “mill” as a tool to help me accomplish a goal. Even when I am going nowhere spinning my wheels. There are also times when I find myself outside running yet feeling like I am spinning my wheels. My run Sunday started just that way. I had a lot on my mind, mostly issues I thought I had left in the past. With less than a mile logged on my Garmin, I knew I had to find a way to change my thought process or it was going to be a “going nowhere” run. At my 1.15 mile mark along my run I pass the home of one of my dearest friends. To my joyous surprise her car was parked in her drive – I had expected her to be out running. I decided to swing by and vent my frustrations to her. Being the awesome friend she is, she threw on her running clothes and ran the rest of my run with me. We talked over my issue, we talked about her busy schedule, we talked about my health issues and some of the expectations to resolve this soon, and we ran together. This was so special to me on so many levels. I was touched that she ran with me – at my slow pace. She is capable of running an easy run at least two to three minutes per mile faster than me. She listened, she empathized, and she ran. We left our frustrations on the pavement behind us with every step. Slowing down when I am already a relatively slow athlete is not something I happily embrace. On the other hand, I have learned to listen to my body before it starts screaming at me. Until my healthy situation is resolved, I have to stop cycling all together. Swimming and running I am able to do, but I have had to reduce the intensity both in the pool and on the run. Five miles seems to be my threshold lately running and speed and tempo runs are shelved for a while. A bit of a step back, but I know it is only for a relatively short time. Progress is often considered to be something that can be measured. Unfortunately life is not linear, so neither will progress move in one direction. Sometimes just treading water is progress if it prevents a back slide. Sometimes taking slow steps forward with the encouragement of a friend, despite the looming clouds of life, becomes the two steps forward to see the sun peeking over the horizon. 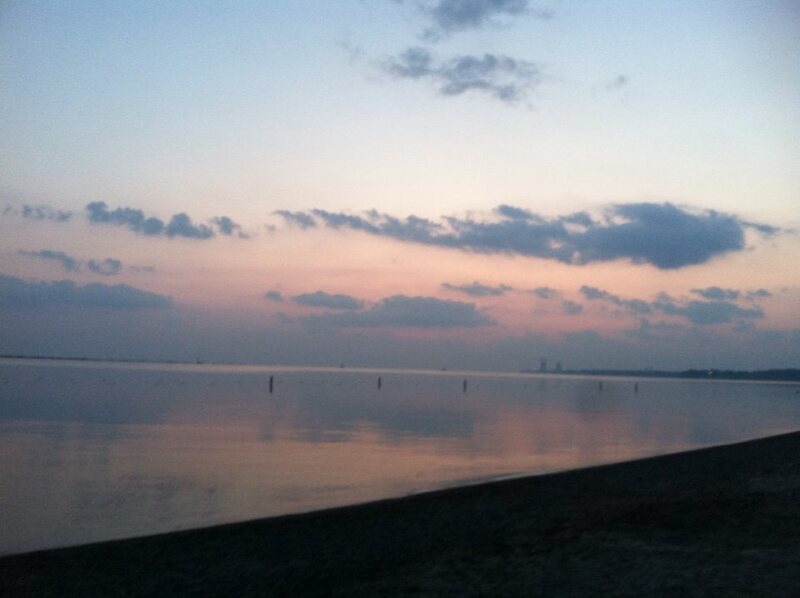 Sunrise on Lake Erie – my friend took this just before an open water swim practice. I’m amazed you can run and vent – I can barely speak when I get my heart rate going! Ha! My friend will tell you or was rather labored for me! Sometimes a run with a friend is just what we need. So glad she was home for you!